Bestselling author Madhur Jaffrey's new cookbook, "From Curries to Kebabs," highlights the vibrant history of Indian spices and their influences on cultures along the Indian spice trail. The book features over 100 mouth-watering recipes that are easy to whip up in your kitchen. We asked her to take our Chef on a Shoestring challenge: to create a three-course meal for four on our budget of $30. Her menu features an appetizer of Eggplant Slices on a Yogurt Bed; an entrée of Boneless Chicken Curry with Yellow Rice and Peas; and for dessert, Yogurt and Apple Raita. Jaffrey was born in Delhi, India, and is an acclaimed actress and cookbook author. She has written more than 15 books and won a James Beard Award for "Madhur Jaffrey's World Vegetarian." She has also been published in several magazines, including "The New Yorker" and "Gourmet." 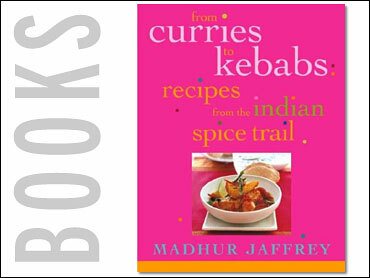 Jaffrey says she wrote "From Curries to Kebabs" because of the increasing popularity of Indian cooking. She wanted to show American home cooks that Indian food is easy, accessible and diverse – offering more than just plain old curry. The book includes not only recipes, but a wonderful insight into the history of Indian food and its influence on other cultures. She writes in her introduction, "Today, curries are eaten in Singapore, Malyasia, Indonesia, Thailand, South Africa, Kenya, Britain, Trinidad, Guayana, and Japan, to list just a few nations. As Indian migrants moved out of India, both east and west, both voluntarily to trade and semi-voluntarily to work as laborers for the British Empire, setting up its sugar or rubber-plantations, they took visions of home-cooking with them." The chef says writing her new book was similar to investigating a mystery because she had to put little pieces together. Her book explores how Indian food has appeared in the cuisines of Africa, the West Indies, Asia, Europe and South America. Jaffrey describes how the spices of India influenced these other cultures and how each culture has adapted Indian spices for use in that country's own cuisine. The book has a number of variations of curry. Jaffrey uses the British definition of curry. She says, "For the purposes of this book, I have designated as a curry any Indian or Indian-style dish with a sauce; just as the British colonialists, who controlled India for centuries before I was born, defined it. It is not exactly my definition. Indians tend to call dishes by their individual names when speaking in their own languages and serve both wet (that is with a sauce) and dry (those in which the sauce is non-existent or reduced) curries. But the British definition seems to have stuck, so that is the one I use here." Our meal began with an eggplant dish. Vegetables, Jaffrey writes, are essential to all Indian meals. "They may be on the table in the form of a salad, they may be immersed in a yogurt raita, or they may appear in a pickled form. They may just consist of green chilies and cilantro ground into a fresh chutney. However humbly presented, they will be there." Many vegetables are served as accompaniments to a curry meal. Jaffrey's Chef on a Shoestring recipe started with the eggplant dish, but it could also be serve as a side dish with the curry. Jaffrey also prepared yellow rice with peas to serve with the curry. "Rice is served with curry in much of Southeast Asia, Myanmar, Sri Lanka, Bangladesh, and south India. But for much of north India and Pakistan and their emigrants in the United Kingdom, the United States, Trinidad, and Guyana, it is breads that are the mainstay." Jaffrey calls for basmati rice in her yellow rice recipe. Basmati rice is literally translated as "queen of fragrance." Basmati is a long-grain rice with a fine texture. Its fragrant, nutlike flavor and aroma can be attributed to aging which decreases its moisture content, according to the Food Lover's Companion. You can find basmati rice at many grocery stores in the Asian food section. It's also available in Indian and Middle Eastern markets. The "yellow" in the rice comes from ground turmeric, which has been used in cooking since 600 BC. Turmeris is the root of a tropical plant related to ginger. It has a pungent, bitter flavor with a yellow-orange color. It is popular in East Indian cooking and is a key ingredient for making curry, adding flavor as well as color. Jaffrey also calls for fenugreek seeds in the amchar masala. Jaffrey says in the book, "Known for their digestive properties, it is these angular, yellowish seeds that give many commercial curry powders their earthy, musky, 'curry' aroma." The dessert is a type of "raita." In India, raitas are very popular. They are are a combination of thick, whole milk yogurt and various chopped fruits or vegetables. Typically, a raita is seasoned with black mustard seeds and herbs such as chervil, coriander, cumin, dill, mint, parsley, or tarragon. Raitas are considered a "cooling" counterbalance to spicy dishes. Madhur Jaffrey currently lives in New York City. The following recipes are from "From Curries to Kebabs: Recipes from the Indian Spice Trail." Excerpted by permission of Crown Publishing. No part of this excerpt may be reproduced or reprinted without permission in writing from the publisher. This Afghani dish is much admired along Pakistan's border with Afghanistan and by those of Afghani descent living in Pakistan... I suspects that all booranis are of Persian origin. The use of turmeric, however, is very South Asian. Peel the eggplants and cut them crosswise at a slight diagonal into oval slices that are about 1/2 inch thick. Spread out in a plate in a single layer. Dust both sides with about 1/2 teaspoon of the salt and then 1/4 teaspoon of turmeric. Rub the seasonings in and set aside for an hour. Pour the oil into a large, lidded pan and set over medium-high heat. When the oil is hot, dry off the eggplant slices with paper towels and put in as many as the pan will hold in a single layer. Fry, turning, until both sides are a reddish-brown, about 3 minutes on one side and 2 on the other. Remove the slices with a slotted spoon and leave to drain on a plate lined with paper towel. Remove all but 2 tablespoons of the oil from the frying pan and set it over medium heat. Put in the onion, and fry, stirring, until the onion pieces turn a medium brown. Add the cayenne pepper, the pinch of turmeric, and another 1/4 teaspoon salt. Stir once. Add 6 tablespoons of water and stir. Lay the eggplant slices in slightly overlapping rows on top of the onions. Bring to a simmer, cover, reduce the heat to low, and simmer gently for 5 minutes. Turn the eggplant slices over, replace the lid and cook gently for a further 5 minutes. Turn off the heat. Just before serving, empty the yogurt into a bowl and add the remaining 1/2 teaspoon salt and some black pepper. Whisk lightly until smooth. Pour the yogurt into a large platter. Lay the eggplant slices over the top, preferably in a single layer. Spoon any remaining onion sauce in the pan over the top, garnish with the mint, and serve. As orders for "curry boneless chicken" come-in, Lola, the chef at the Tiffin restaurant in Port of Spain, as always, wants to know, "Any pepper, any ting?" This curry is made with slices of boneless breast meat that sit marinating in a very Trinidadian mixture of "seasonings." These include a kind of scallion, known locally as saif (possibly from chives), onion, lantern-shaped hot congo peppers, and garlic and thyme (there is a strong Mediterranean influence here as well.) There is also parsley and cilantro (also known as shadow-beni), a New World herb that tastes so much like cilantro that the Indians who landed here began to call in bandhania, or green-coriander-of-the-woods. To fill the order, Lola heats some oil in a frying pan and throws in some crushed garlic and curry powder, followed by the chicken, which is quickly stir-fried. She adds a little water, a little roasted dish is done. It is either served between two slices of bread as a sandwich with lavish sprinklings of hot, hot, hot pepper sauce ("any pepper any ting?") or else rolled in a flat bread called roti, along with some chickpeas and potatoes. I absolutely love it in a sandwich. Because it is just as good cold, I often take it on picnics or eat it straight out of the refrigerator, with a salad, for lunch. To slice the chicken breasts evenly, it is best if you freeze them in a single layer for 35 to 45 minutes first. When they are half-frozen and firm, it is easy to cut them uniformly. I find it somewhat curious that Trinidadians do not use fresh ginger in their curries. They do, however, use powdered ginger, as you will notice in this recipe. You may make your own roasted and ground cumin seeds, amchar masala, and curry powder, but you should know that West-Indian shops sell all of them ready-made in packets and that they are generally very good. To make the marinade: Put the onion, garlic, scallion, parsley, cilantro, thyme, congo pepper, ginger, salt, pepper, and 2 tablespoons of water into a blender. Blend to a smooth paste, pushing down with a rubber spatula when needed. To make the dish: Put the sliced chicken in a bowl. Add the marinade and mix well. Cover and refrigerate for 30 minutes or for up to 3 hours. Pour the oil into a wide, nonstick pan, add the garlic, and set over medium-high heat. As soon as the garlic starts to sizzle and brown, add the curry powder. Stir it for 10-seconds. Reduce the heat to medium, add the chicken, together with its marinade, and stir for 3 to 4 minutes, or until all the pieces turn plain. Add 1/2 cup of water, the salt, cumin seeds, and amchar marsala. Stir and bring to a simmer. Reduce the heat to low and cook, uncovered, for 2 to 3 minutes, stirring now and then. Amchar Masala: A Trinidadian mixture using many of the spices used in Indian pickling. Here they are roasted first, acquiring a dark color and an intense flavor. This mixture is often sprinkled in toward the end of the cooking period. Put all the spices in a small, cast-iron frying pan and set over medium heat. Stir and roast for 1 to 2 minutes, or until the spices turn a shade darker. Remove from the pan, allow to cool, and then grind as a finely as possible in a clean coffee or spice grinder. Empty into an airtight jar and store in a dark cupboard. If roasted and ground cumin seeds are called for, put a few tablespoons of seedsin a small cast-iron frying pan over a medium-high flame. Stir and roast for a few minutes or until the seeds are a darker and smell roasted. Then grind in a clean coffee grinder or other spice grinder. What is not needed immediately may be stored in a tightly lidded jar and saved for later use. The yellow in this rice comes from ground turmeric. The peas may be fresh or froze. Just drop them into lightly salted boiling water and boil until tender. Drain and rinse under cold running water. Put the rice in a bowl and wash in several changes of water. Drain, add fresh water to cover generously, and leave to soak for 30 minutes. Drain. Combine the rice, 2 2/3 cups of water, the turmeric, and salt in a heavy, lidded pan that will just hold the cooked rice comfortably. Stir and bring to a boil. Cover. Reduce the heat to very, very low, and cook for 20 minutes. Lift the lid and add the peas. Replace the lid and continue to cook on a low heat for a further 5 minutes. Mix the rice gently when you serve. I love apple raitas, especially, if the apples are sweet and crisp. The slight sourness of the yogurt mingled with the sweetness of the apple is very alluring. I have taken to using an apple that grows locally. Honey Crisp, but you may choose any that you like. Put the yogurt in a bowl. Beat lightly with a fork until smooth and creamy. Add all the remaining ingredients and mix well.